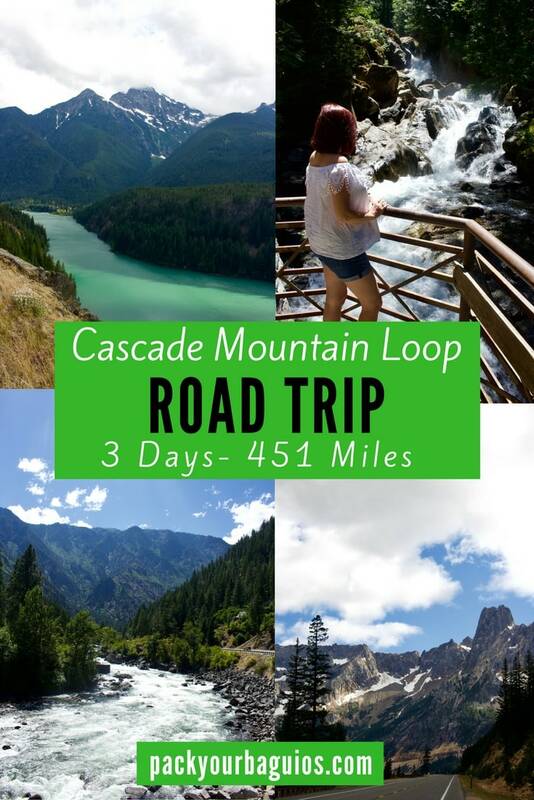 The Cascade Mountain Loop Road Trip is a 451 mile (726 km) scenic drive through some of the most scenic landscape in northwestern Washington State. 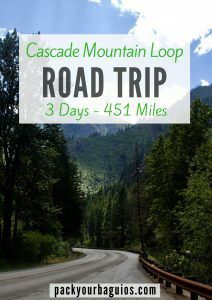 On this road trip, you pass through the Cascade Mountains twice, seeing the lush western side, and barren eastern side. You drive through quiet valleys and pass by the beautiful Lake Chelan. The trip ends wandering through some of the tranquil San Juan Islands. 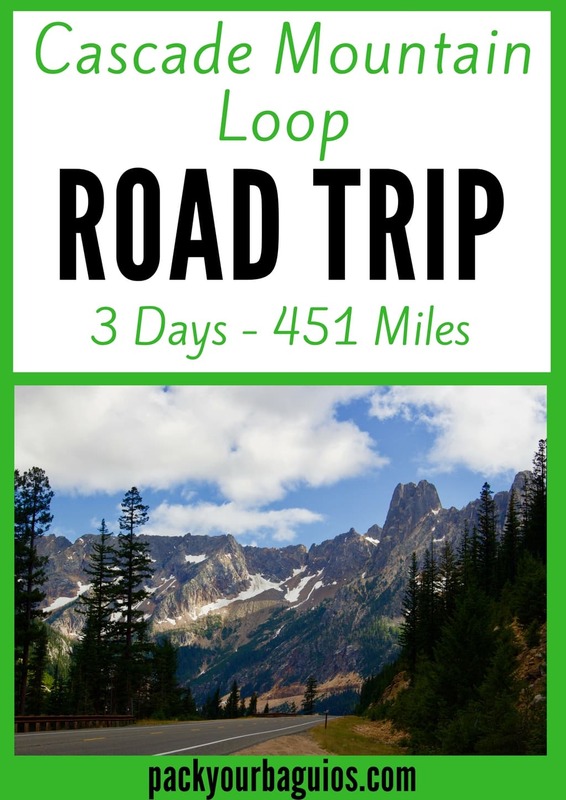 This road trip can be completed in one day, but 3-4 days is needed to throughly enjoy the frequent stops you will want to make along the way. Watch our 2-minute YouTube video! Ideally, this road trip should be taken in the summer or fall. The portions of the Northern Cascade Highway are closed during the winter months. Combine this road trip with the San Juan Islands Road Trip or Olympic National Park Road Trip for an epic Washington State adventure! 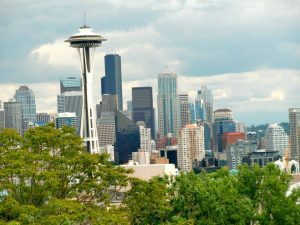 Seattle, WA- Start your road trip in Seattle, the largest city in Washington State and northwest United States. You can easily spend several days in the Emerald City! For Seattle trip details read What to See & Do in Seattle. Start your road trip in Seattle, Washington. Everett, WA- From Seattle, head north on Interstate 5. Check out the beautiful views of the Puget Sound and the Olympic & Cascade Mountains. 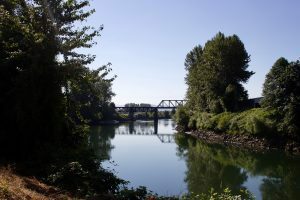 Stop in Snohomish for a leisurely river walk or antique shopping. 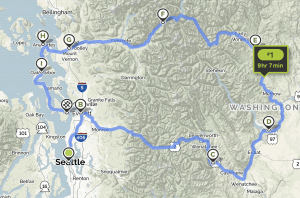 Steven’s Pass Greenway- Next up, you’ll follow the Stevens Pass Greenway, a National Scenic Byway on the Loop. Steven’s Pass follows along the Skykomish River. Be on the lookout for signs alerting you to scenic sites, trails, and pullovers. You’ll pass the little mining & logging towns of Sultan, Startup, and Gold Bar. When you reach the little town of Index, be on the lookout for the Espresso Chalet (Milepost 36). It’s a great place for a caffeine boost, a view of the Bridal Veil Falls (look on the mountainside), and photo op with the giant wooden Sasquatch! The landscape along the Steven’s Pass Gateway is some of the most beautiful in the United States. Sugar Break- Between Steven’s Pass and Leavenworth is a huge candy shop called Alps Candy. STOP HERE! 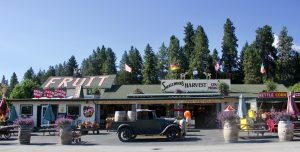 Leavenworth, WA- End your day at Leavenworth, Washington, a little Bavaria-themed town. 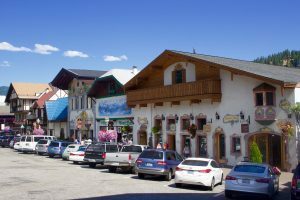 You can easily spend several days at Leavenworth, taking in all of the shopping, hiking, and eating as much German food as your stomach can handle. 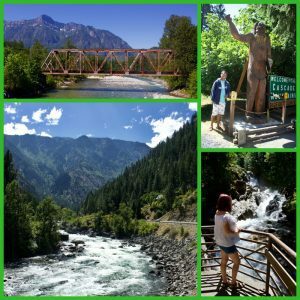 Read What to See & Do in Leavenworth for details! Lots of great shops & German restaurants in Leavenworth, Washington! Leavenworth to Newhalem (189 miles/304 km)- The northern portion of this leg is often closed in the winter (area in red). On day 2 of the Cascade Mountain Loop road trip, the landscape changes dramatically. Gone are the tall evergreens. You’ll see the results of the rain shadow effect caused by the tall Cascade Mountain Range. The climate is dry here, resulting in a harsher, more barren mountainside. What I like about this side of Washington is that the ridges and jagged edges are more pronounced. In some areas, it feels like you’re on another planet! Fruit Stands- Right east of Leavenworth, you will come across lots of fruit stands, wineries, and candy stores. We stopped at Smallwood’s and loaded up on sweets, Mt. Rainier cherries, and gifts to take home. Visit Smallwood’s for fresh fruit, jams, and tasty sauces! Cashmere, WA– In small town Cashmere, you’ll find an all-American community. The historic district has cottage-style homes dating back to the early 1900s. 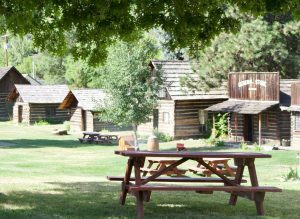 In the Cashmere Museum and Pioneer Museum, you’ll find 20 original buildings recovered from north and central Washington. The Devil’s Gulch Mountain Bike Trail is located just south of town and it one of Washington’s premier downhill trails. Take some time to walk around this sweet little historic area! 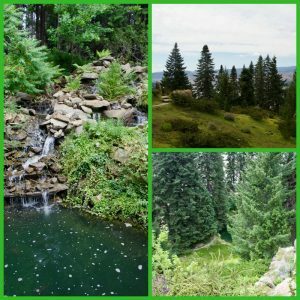 Ohme Gardens- At the town on Wenatchee, schedule and hour or two at the beautiful Ohme Gardens. The gardens were started in 1929 as a family retreat until being purchased in 1991 by the Washington State Parks. Rocky Reach Dam- Turning north on Highway 97A is the Rocky Reach Dam. 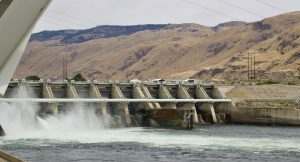 Visitors can take a free self-guided tour which includes the history of the dam and a fish-viewing window. We spent about an hour at the dam and could have easily stayed longer! Take a free tour of the Rocky Reach Dam! 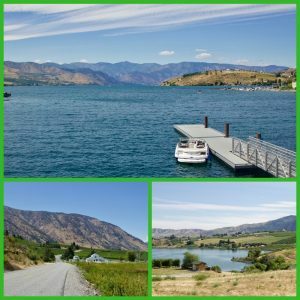 Lake Chelan- Continuing north on Highway 97A, you’ll come to Lake Chelan, one of the most beautiful lakes in the world. At the lower end of the lake is the town of Chelan. This is a great stop for lunch and to stretch your legs as you walk along the lakeside. Just outside of Chelan is the town of Manson. For a scenic side trip, drive along the Manson scenic loop for great photo ops of orchards and vineyards. 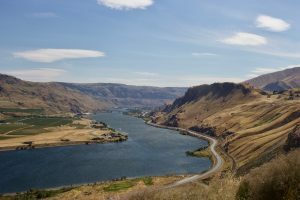 Columbia River- As you make your way from Lake Chelan to Pateros, Highway 97 parallels the Columbia River. The river is 1,243 miles (2,000 km) long, is the 4th largest river (volume) in North America, and has the largest flow of any North American river entering the Pacific Ocean. We pulled over frequently to admire the majestic Columbia River with a rugged mountain backdrop! Winthrop, WA- At Pateros, turn left onto Highway 153. 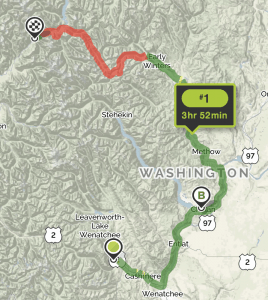 You’ll pass the towns of Methow, Carlton, and Twisp. Twisp is a larger town and is a good place to grab a bite to eat and fuel up. There is also a wide variety of lodging choices here if you need to call it a day. Continue on to Highway 20 (also called the North Cascades Highway). 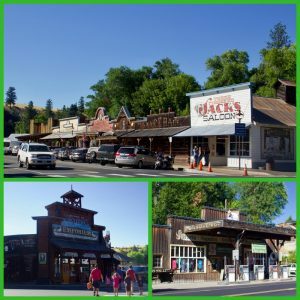 As you continue driving through the valley, you’ll enter the wild west town of Winthrop. Walk along the wooden boardwalks, enjoy some shopping, and take tons of pictures! Gas and food stops get pretty scarce as you continue west, so stock up! 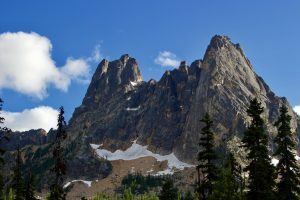 As you continue west on the North Cascades Highway, you’ll soon come to some of the most dramatic landscape in North America. This track of highway is the main reason the loop should be traveled counter-clockwise. The first jaw-dropping moment will be the iconic Liberty Bell massif. This is the most photographed part of the North Cascades Highway. The Diablo Lake Overlook is another “Wow!” moment. Don’t rush through this part of the loop! All along the way are waterfalls, trails, and pullout for lots of photograph opportunities. Be forewarned, even in late July, it is windy and cold!!! 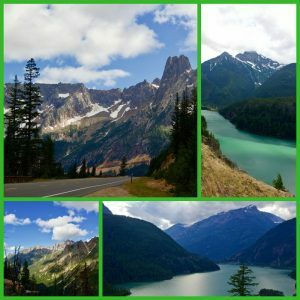 Highway 20, the North Cascades Highway, is one of the most scenic stretches of road in North America! End of Day 2- End your day at Newhalem, Marblemont, or Rockport. Sleep well! 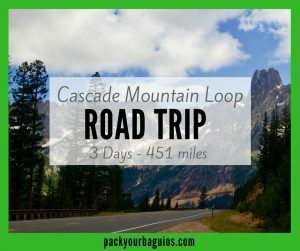 Final leg of the Cascade Mountain Loop Road Trip! 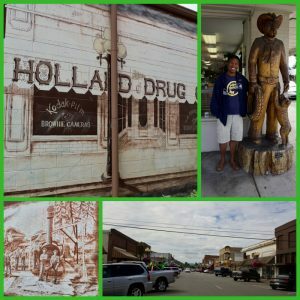 Skagit Valley- For the last section of the Cascade Loop, you’ll pass through several little historic towns scattered among one of the biggest flower bulb areas outside of Holland (March-May is ideal for viewing the flowers). From this valley, Mount Baker provides more dramatic scenery! This area has long been logging country. This is definitely evident with the amount of large wooden sculptures that dot downtown areas. Burlington, WA- As you continue to head west on Highway 20, take time to stop in the logging town of Burlington. We loved walked up and down the historic downtown area. There are lots of murals and large wooden sculptures here. Anacortes WA- Continuing west on Highway 20, cross over onto Fidalgo Island to Anacortes, Washington. In Anacortes, you’ll find a major ferry terminal, so if you can easily start a tour of the San Juan Islands. 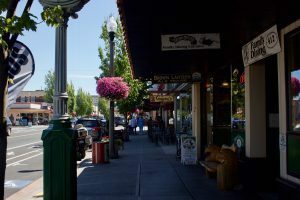 Anacortes also has an interesting historical downtown area with restaurants and shopping. Deception Pass- From Anacortes, head south to the Deception Pass Bridge. The bridge is one of the most photographed spots in Washington State. 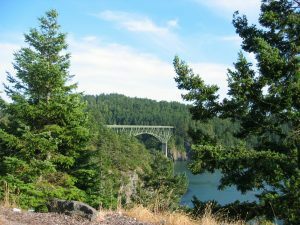 There are miles and miles of hiking here at Deception Pass State Park. Whidbey Scenic Isle Way- Deception Pass Bridge connects Fidalgo Island to Whidbey Island. 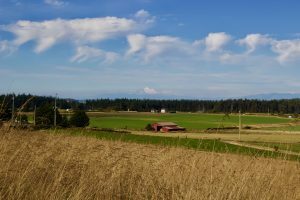 Travel south on Highway 20, which is also called the Whidbey Scenic Isle Way. This portion of Highway 20 is 46 miles (74 km) long and runs the length of the island. The whole road is a National Scenic Byway. Along the way, you’ll see the historic towns of Oak Harbor and Coupeville (Second-oldest town in Washington). Spend some time in Coupeville. It has over 100 buildings on the National Historic Register. We always find good eats there! 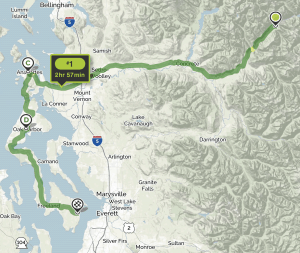 Clinton, WA- The final stop of the epic Cascade Mountain Loop Road Trip is on the southern tip of Whidbey Island. From here you’ll need to take a ferry from Clinton to Mukilteo. Ferries depart every 30 minutes and the whole ferry ride is only 30 minutes long. From Muliteo, Seattle is only 25 miles (40 km) away! Have you been or want to go on an epic road trip? Please share by commenting below! Any questions? Please ask! Keep up with all of our travel, camping, and cycling tips by following us on Facebook, Instagram, Twitter, and Pinterest. Leave us your email (blue box at the bottom of the post) to subscribe to our weekly newsletter and never miss a post! Like this post? Please share/pin it! Keep up with our latest tips and adventures and never miss a post. NO SPAM ever!